It is important to learn English because it is an international language which is used in many countries over the world and widely used in many sectors such as information, trade, education, etc. In Indonesia, English has an important role especially in education. Therefore, English is taught as the first foreign language in all levels of schools and language courses. In elementary school, English has been taught as a local content. Since The Basic Course Outlines of the 2004 Curriculum states that the objective of learning English at elementary school as a local content is to develop students' communication ability in the context of school (2004: 7). It means that the students are expected to be able to make simple transactional and interpersonal conversation which is potentially needed to communicate in the context of school. Here, the teacher plays important role since he has to be able to set students interest and motivation in learning English in order to develop students’ ability to?? 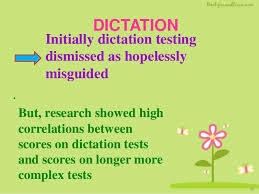 Belum ada tanggapan untuk "DICTATION AS A TESTING TECHNIQUE IN MEASURING THE STUDENTS’ LISTENING MASTERY"